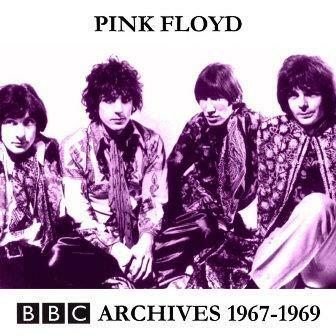 BBC Archives 1967-1969 est un bootleg de Pink Floyd compilant les BBC Sessions enregistrées entre septembre 1967 et juin 1969. Le son est superbe, d’autant plus que cette version est la révision A, supérieure à la version standard. Du grand art, à se demander pourquoi ces archives de la BBC ne sont jamais sorties officiellement tant elles sont parfaites ! Le fichier texte distribué avec le bootleg et qui inclut beaucoup d'informations sur les spécificités de la version Rev. A. Well it's that time again! Another ‘rev A’ release is ready to go. This time the treatment goes to HRV-CDR-008 - BBC Archives 1967-1969. Back when this title was orginally released, Marc-Olivier did an exhaustive comparison between it and the RoIO known as “At Dawn v4.00”. He found neither entity to be superior to the other. Each one had its strong points in different areas and he suggested an amalgamation of the two. A little later, we also learned that the speed used for Scream Thy Last Scream and Vegetable Man were incorrect. Another flaw existed with the 1967 sessions. These were originally mono broadcasts. But due to “old age” of the tapes, the original BBC6769 Harvested release had some channel balance problems. Our original release was a little hissy. The “At Dawn” version had been equalized to eliminate the hiss, but this was overdone and resulted in a “bassy” track. I've reequalized our original track. The rev A version is not hissy and not bassy either. The balance has been recentered to mono too. The balance has been recentered to mono. The “At Dawn” version was slightly clearer than our original. This rev A release uses the “At Dawn” version with the balance recentered to mono. Ron also reFrankentooned the first note. In addition, the tray artwork has been updated to give the correct spelling of ‘Matilda’. Again, the “At Dawn” version is used here as it had slightly better SQ. We used our version to restore the start of the song that was missing on “At Dawn”. The balance was recentered to mono. The balance was recentered to mono. The “At Dawn” version is used here. And the balance was recentered. But that's not all…This is the biggest change on this release. The speed has been significantly slowed down. The recent Omnibus special on Syd Barrett and the Pink Floyd included some snippets of Vegetable Man. The RoIO used for this BBC show came direct from the BBC Archives. As such, we feel we may have found a valid speed reference. The speed of Vegetable Man on our rev A release matches that used in the Omnibus special. This is a lot slower than you're probably used to hearing for this song. But, it is very nice and natural. Enjoy! A balance recentered, speed corrected version sourced from “At Dawn” is used here. A balance recentered “At Dawn” version is used here. “At Dawn” version used. Pop at 1:09 fixed. “At Dawn” version used. Pop at 0:24 fixed. Our original version with the original patch job at the beginning rebalanced to have a more natural transition. Glitch at 2:36 fixed. To conform with the Man and the Journey theme of this performace. The title ‘Cymbaline’ has been changed to ‘Nightmare’ in the revised artwork. The song is our original unchanged. So, as you can see, this new version of BBC Archives 1967-1969 has a lot to offer. Let the weeding begin. Remember, for a single disc release such as this, only 3 weedlings are required to fullfill your obligations (not 5). Pour les petits nouveaux qui ne sont pas au courant, "Murderistic Women" est une courte (moins de 3 mn) version précoce de "Careful With That Axe Eugene", sans le cri, et "Massed Gadgets Of Hercules" est une version précoce assez courte de "A Saucerful Of Secrets". Cette dernière, bien que courte (moins de 7 mn), est déjà un beau bébé : tout ce qui fera le grand Saucerful que nous connaissons y est déjà en germe. de nouvelles sources, un nouveau mastering, des morceaux en plus. ca ressemble davantage a ma compil The Complete BBC Sessions CD1&2; avec un meilleur son. mais sans les commentaires (dommage).